Purchased at local Sam Ash with 20% off coupon. $319 (plus tax) out the door. No case or gigbag, just a cardboard box it shipped in. Build Quality: I got the vintage burst which is more orange than yellow fading to dark brown. Everything screwed down tight, no flaws in binding or finish. Nice Grover tuners that hold well, the bridge and stopbar lock down ... sort of their take on the Tonepros concept. Nice the tailpiece stays in place when you change out the terrible strings it came with. The toggle switch, pots etc actually seem to be fairly high quality which surprised me. Now the downside. The frets had file marks on them, there was no attempt to polish them. I used some Stewmac fret polishing eraser thingees and eventually got them smooth. One fret (the 18th) was high and I had to take a more off to get so my fret rocker didn't rock and I could do three step bends without choking out. (That drove me nuts - I couldn't get lowish action the way it shipped). Also, the rosewood fretboard was dry and had some sort of dye on it that turned my fingers black! A bit of lemon oil and a lot of rubbing eventually got it off and revealed a nice figured board. I have no idea why they do this. As it stands now the action is low (for me), I can bend like crazy and not fret out. I should also mention the nut is really cheap plastic and has to go, but it is smoothed and slots are OK. But it really a cheap hunk of softish plastic and bugs me. I see a bone nut in the future as the only upgrade it needs. Sound: It came with 'Pro Buckers' which are alnico 5 fairly low output vintage types and while I figured I'd probably swap them for something 'better' they sound really nice. They are very height sensitive and I had to fiddle with them, especially lowering the bass side and raising the treble (like a Strat) to get a balanced sound. They also have coil splitters which I don't use much. They lower the volume a lot and add some noise but then again if I want to sound like a Strat I play one. It might be just me - your mileage may vary. Playing through a Mustang III (my only amp at the moment) using a Twin setting it sounds great for classic rock and blues crunch. At real high gain on the amp they don't do it for me but that's not the audience this was designed for. Note the overall impression I have is it sounds more like a solidbody then semi-hollow, although it does have some 'air' to it. The sustain is good but it takes a bit longer for the notes to bloom then say my Carvin carved top. So, it you're willing to invest some time and effort to get the frets polished and cleaning the board you'll find this a nice enough purchase. The electronics are solid, the build quality is good and I'm glad I got it. Nice thorough review! I like the one I played at Guitar Center about a year ago. 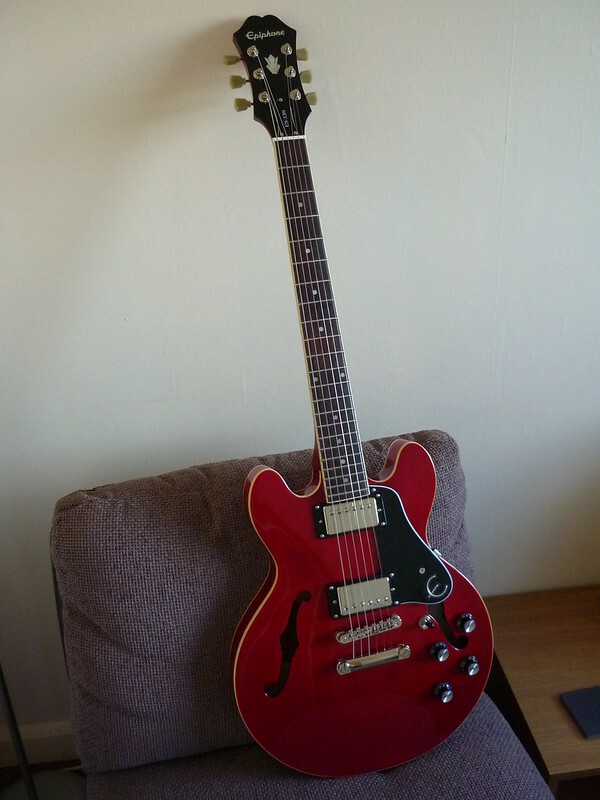 If I ever decide to get a semi-hollow body guitar that won't break the pocket book that would be it. Thanks Bubbalou! One thing I forgot to mention is the ergonomics. I sold a v.nice all maple Dot that I bought used with upgrades - all new wiring pots etc and Duncan '59's. Sounded great played great but that thing was huge! I'm 5'9 and sitting down or standing it was just too big for me. And it was heavy. The 339 weighs a hair over 7 lbs and is extremely comfortable to play. That's what first attracted me to it. Great guitars for the money. I have one in natural finish. I even think the stock Pro Buckers on these guitars sound great. Great review. I'm 5'7" and my Epiphone Sheraton II, while a great guitar, is too big for me. I've had the 339 in my hands at a music store and love the size and weight of it. Prices are about the same up here and I seriously want one. Correction to my above statement....the pickups are Epiphone Alnico Classic Pro's. But they do sound great as stated above. The Pro Buckers are Epi's version of the Burst Buckers and are offered on other Epi models. I bought one in the natural finish. My review would pretty much mirror the OP's opinions, except I didn't have any serious problem with the frets. Mine needed polishing, but not leveling or fixing any file marks. My only problem isn't with the guitar, but having bought it unseen, it has a rather small neck profile for my big hands. I bought it unseen on principle. I prefer hollowbody tone over solid body. I love the versatility of splitting coils because I'm cutting down on electric guitars and I thought maybe this would be the do all be all. Unfortunately, just to my ear, so YMMV, I prefer the sound of my Epi Les Paul Traditional Pro. The coil splitting seems to provide a wider variance in tone. I'm not sure why that is. In general, the woodwork is excellent and it's a guitar worth building on if you prefer. I'm a big guy who is perfectly comfortable with a 335, so the smaller body is not really a benefit, but I know tons of people who do see it that way. The 339 is going to be a great guitar for most people. Very happy with my cherry red version. Hard to put down, only to wash the black off my fingers! Will clean up the fretboard when I get round to changing strings. Mine came with fairly decent strings on it, Gibson Brite Wires I believe. I had to recut the nut on mine, lowered the action and tickled up a few fret buzzes. The bridge saddle heights don't conform to the fretboard radius so I adjusted the saddle grooves with my needle files. Only thing I changed was the black switch tip for ivory. Mine has a tendency towards neck-heaviness but it's fine hanging from a suede strap. Highly recommended, the price is a steal for the sound and playing experience. I love mine! The setup out of the box was good. No hint of any black on my fingers. Playing thru a Mustang III v.2. Great little rig! I love these guitars. Like all Epi's I think it would look better to remove the big plastic E on the pickguard as it looks a bit cheezing. My one and only complaint with a very simple fix. Seriously good guitars. Like the Headstock also. Picked up the Gibson version, Trad Pro, for a steal at GC. Love the size and weight compared to my ES-347. Great Price. Better than my GC Cherry. Do all of these have the black finger stain? Hope not. Havenn't played mine enough yet to actually know. How would have your frets gotten scratched? It was new, right? Malcolm: Yes, it was new and it appears they didn't clean up the frets from about the 12th on up. This guitar was early in the run - the first (and only) one Sam Sah had at the time when they first came out. The dye they use on finger boards doesn't appear to be unusual for new Chinese Epiphones. I tried out a Casino Coupe and it did the same thing. I've had my Cherry ES-339 Pro for a bit more than a month now. For me this has turned out to be a really nice guitar. It is my first semi or full hollow body. I've tried humbuckers before but back then I had no idea what tone was. The neck did need a quick cleaning and I put on new strings. Other than that and playing with pickup height I've been really enjoying this guitar. My other two guitars are Strats so this definitely is completely different. This is a really nice guitar and a definite keeper for me. It wonlt replace my strats but it does give me something completely different and fun to play. I bought a black one from my friend for a low price. It was stamped 'used' and was from a refurbishing company. I cannot tell what defect, if any, caused it to be sent there. Anyway, it actually has the best action of any guitar I've had. Very low, with no buzz or choking, with only about .005 relief. Nut is cut correctly. But it certainly doesn't sound like a full-size 335. Compared to my '95 335 with Classic 57's, it lacks punch and fullness to the sound. But it is still a nice guitar and worth the $250 I payed for it with a new Epi case.